German ethnographer and geographer; since 1890 editor of "Globus"; born 1835 at Brunswick. In 1881 he produced "Zur Volkskunde der Juden," with a map of the distribution of the Jews throughout central Europe. Though written with something of an anti-Jewish bias, the book was the first attempt at a scientific account of the anthropometric and biostatic peculiarities of the Jews, regarded as a special race. It also gives an account of their customs and folk-lore as described in the works of travelers and ethnographers. In many respects it has not yet been superseded. 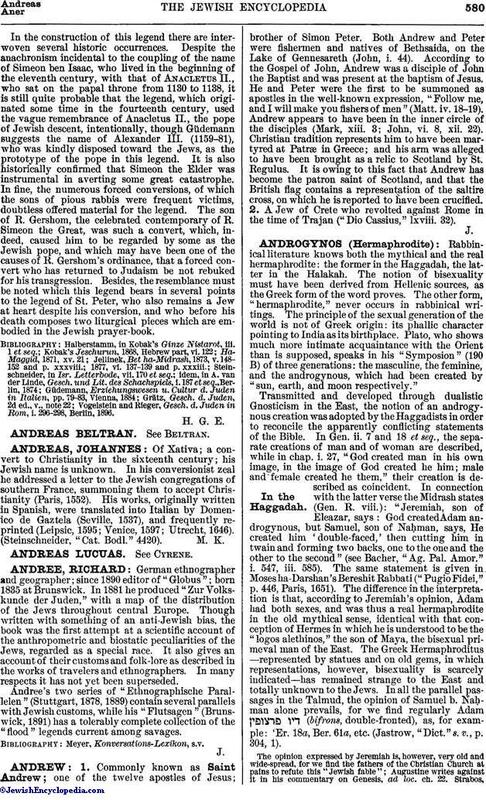 Andree's two series of "Ethnographische Parallelen" (Stuttgart, 1878, 1889) contain several parallels with Jewish customs, while his "Flutsagen" (Brunswick, 1891) has a tolerably complete collection of the "flood" legends current among savages.